It's easy to name many recording artists whose first albums were clearly better than their subsequent ones, and unfortunately, the Violent Femmes are one of them. I liked the vast majority of the songs on their self-titled debut, which obviously made any subsequent album disappointing in comparison. While bands should be able to change their style and not feel pressure to clone a past success, it is too bad they didn't give us more of what we loved about that first album, but nonetheless understandable since it would be impossible to live up to. It would be difficult to duplicate an album so youthful due to the simple fact of aging. Without a doubt, the band’s legacy is their first album, which I am arguing was an instant classic. Seems like even if they resolve their differences about royalties and personality conflicts with drummers or whatever, they've matured, and for that reason alone won't be able to easily repeat what most of us loved about them early in their career. This is one of those bands where people like me were careful about who we admitted we liked the band to. I was a somewhat average, heterosexual 16 year old guy who was hesitant to like this group when I first heard their band name, and further, after hearing the singer's somewhat gayish-sounding voice, but I got past my initial homophobia and embraced the "femme" aspect just as I eventually thought the Rocky Horror Picture Show was pretty cool, despite it's gayness. The love songs were universal and seemed to be a dude singing about or to a chick, and were ambiguous anyway, if not intentionally so. The reason wasn't a case of a straight guy getting in touch with his feminine side necessarily, but it was the fact that this music was impossible to not like for many reasons. This was something totally new and bold, and I couldn't help really liking it, but I wasn't sure I could easily explain why back in 82 or 83 - I thought they were badass because they dared to be different. When I discovered that album, and gave it a chance, it made a lasting impact on me and I still consider it one of the best albums ever made. I thought I'd blog about why I thought it was so great, so here goes. 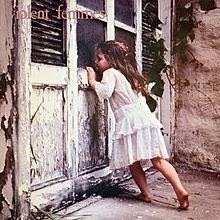 What I loved about that first Violent Femmes album was the combination of 1) the unique instrumental sound (acoustic bass guitar, minimalist drums w/ brush, and acoustic guitar all playing a variety of tempos with hints of reggae, country, blues, folk, and punk rock), 2) the unique sound of the singer's voice (raw, whiny, full of rebellious emotion - from lust to rage), and 3) the lyrical content, full of universally-appealing high school angst. That wasn't all. 4) Usage of explicit lyrics and the xylophone were surprise bonuses that added to the appeal. Topping it all off was 5) this artsy theme of contrast - the music went from slow to fast, the subject matter juxtaposed dark and light, etc., and then the always-important band name reflected that, and finally, the cover art of the girl tied it all together perfectly for an irresistable package. It is for these aforementioned five main reasons I consider it a classic and believe it will stand the test of time. Another indicator is I recently moved to a university town, and they still play it on college radio. You never hear REM anymore, but they still play VF. The mostly-acoustic, simple, minimal sound played with passion and aggression led me to later have an appreciation for MTV’s Unplugged show starting in the early 90s, which features electric rock bands going mostly acoustic. It also led me to discover similar music such as early T-Rex, Meat Puppets II, Pixies, the Pogues, Gogol Bordello, and several others. I recently joined a song-per-week club where new original songs are posted online for review. You write a song, you record it, you upload it, you review and comment on other’s posted songs, and read other’s reviews of songs you posted. That’s all you do. Simple enough. Right now, it’s just myself and another songwriter who agreed to try this. The tool we decided to try for this is YouTube, believe it or not. Using a webcam, we record ourselves on our computers, then upload the videos. There’s a built-in comment feature we use to review the other guy’s songs. You just type stuff and click a button. We could’ve used SoundCloud or some other free online file sharing technology like DropBox or just Google Drive or something, but didn’t. We could’ve used some type of online group forum service or even live video like Skype or Hangouts, but we didn’t want to have it be real-time. YouTube is really easy to use. We don’t need to see each other necessarily, so the video aspect doesn’t add anything really. It’s all free, and the bonus is we set it up so that it’s automatically private. That means only the two of us can listen to, or “view” in this case, each other’s songs. To make it work, we had to use it with the integrated Google Plus social network, which enables more than one person to have sufficient manager rights to post to the same channel. Even though you can’t hear any of the privately-shared songs, you can read about the rules we set up for our group on the About tabs. In the future, we might decide to invite others to join. Also, in the future, we might decide to “make public” our favorites. The guidelines should be universally useful to any similar online song critique group. This post, however, isn’t about the tools and rules. Although the technology is fine, what I mean to examine and describe here is 1) the motivation behind the decision to start this group or club or whatever you want to call it, and 2) what I’ve gotten out of it so far. The main reason we agreed to do this was that it would be like signing up for some recurring group thing, like a sport, or lessons, or a class of some kind – such things motivate you to “show up” once you’ve made the commitment. So, establishing one song a week as the deliverable and a deadline (happens to be every Tuesday) would force us to be more prolific, and to write songs according to a schedule. We thought this would produce more songs overall than our current production output, and indeed it has. So, yes, having to deliver on a schedule does make you write more songs than you normally would. For me, I sometimes will write three in one night, but other times go three months without writing anything. So, theoretically, this would be better for me. We also thought a usual keeper ratio would apply, just as it has over long periods of time where we’ve each noticed that no matter how sporadic, once we each had a batch of new songs written, about ¼ of them were pretty good. This hasn’t been the case with me so far, but it might prove to be over the long haul. I’ll just have to wait and see. It makes me realize moving to Nashville and writing to meet a deadline or a quota would be a challenge. For some reason, it spoils the creativity. I find myself writing something just to meet the requirement, rather than waiting to be inspired by the muse. Waiting for the muse to show up can take a long time sometimes. I am starting to think that taking breaks from writing can be a good thing, just like with relationships – an absence making the heart grow fonder type of thing. On the other hand, maybe the increased frequency will help hone my skills, just as practice for anything usually helps you get better at it. I’m waiting to see if this experiment will be a detriment to my enjoyment of the craft. If I’m writing songs that are below my own standards just to meet a deadline, consistently, maybe I won’t be better off. On the other hand, maybe practice will pay off eventually by improving my overall skill level, and even if the keeper ratio doesn’t improve, I’ll still feel like I have recyclable portions of songs for future use, and that alone may make it worthwhile. So far, I’m six weeks into this, and out of my six songs so far, there’s only one where I like the lyrics, and portions of a couple others where I like the music. Time will tell. Visit again sometime and I will post an update.